Produced by Britain's public service Channel 4 one year after its first broadcast, Mike Leigh's Meantime (1983) blindsided viewers with a stark, unflinching look at two families in London's East End during a recession. There's very little plot and thus not much in the way of conflict resolution; more often than not, we're just presented with short windows into a dismal, claustrophobic landscape that may or may not be recognizable to the viewer. Any film that doesn't hinge on eventful storytelling better have some great characters and performances to back it up; luckily, Meantime has a few cards up its sleeve. 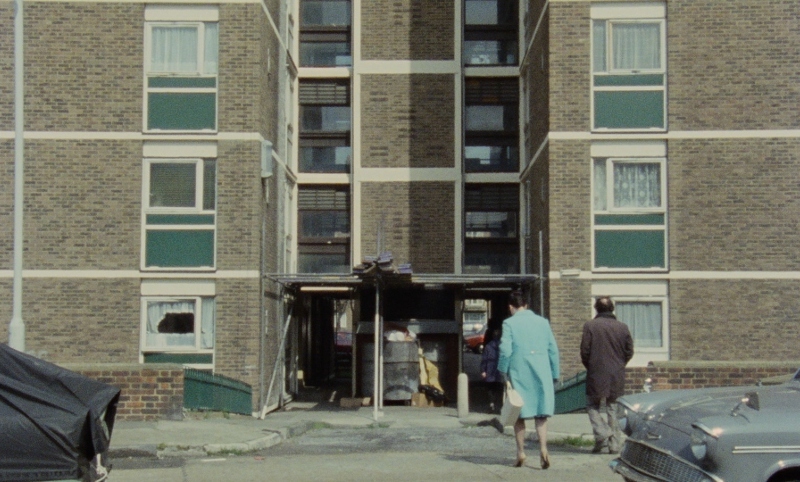 We mostly follow Mark Pollock (Phil Daniels, already an established actor and the future narrator on Blur's single Parklife) and his brother Colin (Tim Roth, in a very early role), who live with their parents Mavis (Pam Ferris) and Frank (Jeff Robert) in a run-down public housing apartment. Theirs is a dismal existence: Mark and mentally challenged Colin wander about during the daytime, often at the local pub with or without skinhead Coxy (Gary Oldman, in his first major role), and sign for Jobseeker's Allowance with their irritable father every two weeks. Occasionally, the Pollock family crosses paths with Mavis' sister Barbara (Marion Bailey, Leigh's longtime partner and frequent collaborator) and her husband John (Alfred Molina), who live more comfortable lives in a wealthier part of town but seem every bit as miserable---if not more so---behind closed doors. Though Meantime isn't an easy film to watch due to its almost oppressive cynicism, it does a fine job of presenting us with memorable characters and letting them stew in their own juices. It's a purely observational piece that, like the majority of Leigh's work before and after, reads more like a stage play than anything else. Yet the film's obvious time capsule appeal and realistic, moving performances elevate an otherwise flat story to greater heights. That said, Meantime is not a perfect film: Leigh's storytelling feels more than a little unrefined in certain areas, and the unusual soundtrack---full of almost random piano segments and dated saxophone cues---is a major handicap at times, as it ruins a few dramatic moments and makes the film feel more repetitive and predictable than it really is. Still, Meantime is a respectable early career highlight for Leigh several cast members, especially considering it was a made-for-TV film on a fledgling network. Largely absent on home video in the US (save for a horrible 1999 DVD by Fox Lorber), Criterion resurrects Meantime on Blu-ray almost 35 years after its television debut. It's a mostly well-rounded package with solid A/V specs and a few informative extras, and one that die-hard fans should enjoy. This new 1080p transfer of Meantime, sourced from a new 2K restoration, was supervised by cinematographer Roger Pratt and director Mike Leigh. It's an eye-catching presentation that will certainly impress first-time viewers or those who haven't seen it in a decade or more, as the pronounced film grain and strong levels of detail are quite striking. Texture, contrast, and black levels are uniformly strong as well (if not prone to crush at times), and everything works together to give Meantime a distinct appearance that defies its 16mm made-for-TV roots. My only other issue is an obvious teal/cyan push that's unfortunately becoming all too common in the bulk of Criterion's recent output; despite the participation and approval of Meantime's DP and director, this obviously represents something of a revised color scheme that might bother those who look for such things. Otherwise, I have no complaints with its appearance at all. Less obvious but still appreciated is the linear PCM 1.0 mix, which replicates the down-to-earth dynamics of Meantime's dialogue-driven soundtrack. There's a modest amount of depth at times, but this is a largely straightforward audio mix that rarely steps outside genre boundaries. The music tends to overpower several scenes, although it's slightly more balanced here than in past releases. Optional English subtitles are included during the film only. As usual, Criterion's menu is smooth and easy to navigate. This disc is locked for Region A players only; it's packaged in Criterion's stocky keepcase with appropriately garish cover artwork. A fold-out Booklet includes notes about the new restoration, production photos, and a lengthy new essay by film scholar Sean O'Sullivan. Not much on paper, but what's here should appeal to die-hard fans. First up are two recent Video Interviews; the first and most interesting features Mike Leigh with musician Jarvis Cocker of Pulp (35:04). Topics of discussion include their first meet-up at a film screening in the early 1990s, militant feminists, Meantime's initial reception from critics and audiences, realistic vs. idealized characters, the burgeoning disease of unemployment, and more. Actress Marion Bailey sits down with film critic Amy Raphael (28:22) to talk about meeting Mike Leigh at a nightclub in 1978, her approach to acting, developing characters, improvisation vs. following a script, her other work with Mike during the last several decades, and other items of interest. Both interviews offer valuable first-hand accounts of the film's production, as well as a solid amount of historical context that may help newcomers fill in a few blanks. A third Interview with actor Tim Roth (31:43) was originally recorded in 2007 and likely carried over from an international home video release. It's decidedly rougher around the edges and presented in more of a Q&A format, but Roth offers plenty of insight regarding his performance, the film's production, and working with Mike Leigh so early in both of their careers. As Meantime was a made-for-TV film, no trailer or other promotional clips are included. 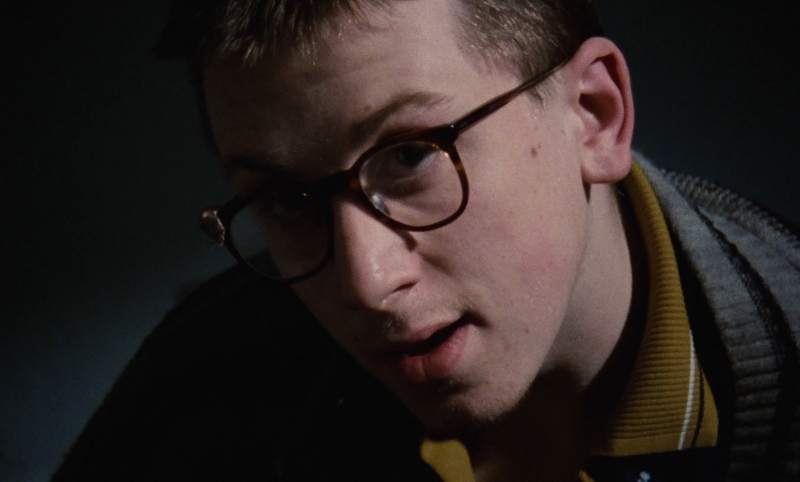 Mike Leigh's Meantime is an early career highlight, though more for its outstanding cast (filled out by Phil Daniels, Tim Roth, Marion Bailey, Alfred Molina, and a very young Gary Oldman) than the story. Most of its characters are extremely tough to root for but entirely human; trapped in unfortunate circumstances and feeding off each other's' anger, they seem almost doomed to spin their wheels fruitlessly. It's a claustrophobic and compelling formula, although the oddball soundtrack undercuts a lot of dramatic weight and ultimately feels distracting. Criterion's new Blu-ray easily outpaces Fox Lorber's horrible 1999 DVD and will certainly boost your appreciation of the film thanks to its solid 2K restoration, lossless audio, optional subtitles, and a small but enjoyable collection of extras. Recommended.